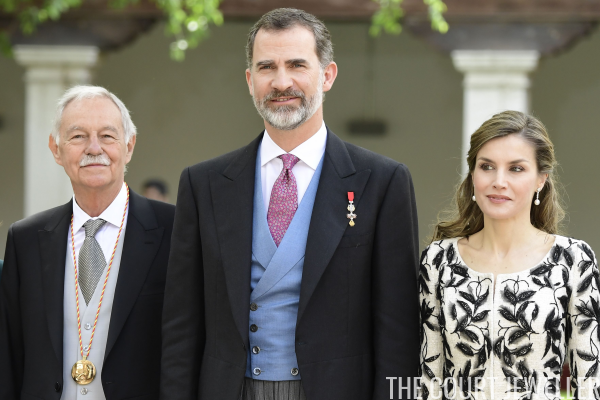 The Spanish royals continued their celebration of the 2016 Cervantes Prize on Thursday, and Queen Letizia upped her jewelry game for the annual award ceremony at the University of Alcala de Henares. Letizia chose her diamond and pearl drop earrings for the ceremony. The earrings feature a bezel-set diamond stud and round Australian pearl drops. She's had this pair in her jewelry box for years. 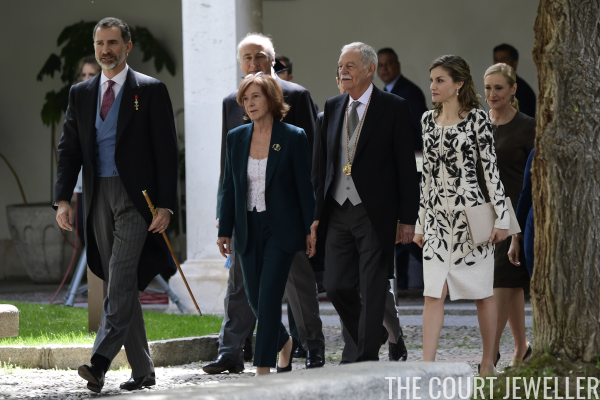 Felipe was also extra dapper today in morning dress, even carrying a walking stick. He wore the ribbon of the Order of the Golden Fleece pinned to his jacket. Pictured with Felipe and Letizia here is the winner of the 2016 prize, novelist Eduardo Mendoza Garriga. The prize, which is named after the great Spanish writer Miguel de Cervantes, is the most prestigious award given to literature written in the Spanish language.